By the time we took the JR to Nara it was about 3:30 or so. Even though we had directions to our B&B we decided it was in our best interest to stop by the Tourist Info desk at the station to see what maps they had as we were not that satisfied with what we had already. The people there were incredibly friendly and gave Charlton a great map of the city and even marked our B&B on the map for us. By this time it had started to get pretty warm and we had to haul our packs through town, not much fun. Thankfully our B&B was relatively close so it wasn’t too bad, although we were both sweaty (ugh!) The owner of our B&B was super nice and gave us cold green tea as soon as we got in the door. The Nakata B&B is absolutely gorgeous! I love that we are staying here, total upgrade from our place in Takayama. I made sure to double up our futon tonight as I learned I suffer from princess and the pea syndrome. After getting settled in and the owner giving us some tips on navigating the city we headed out at a much leisurely pace than we have been touring with. We strolled through town saw the 5 storied pagoda, then walked though Nara park and saw all the beautiful TAME deer, then went to the deer preservation house. It was too late to see many of the temples, and I thought the one that stayed open the longest would be closed by the time we got there so we decided we would just go for a nice walk through the rest of the park. But lucky for us, Nara is easily navigated on foot and we ended up in front of the Tadai-ji about 30 minutes before it closed. We decided to go for it and we were glad we did. The temple is awe inspiring and absolutely stunning. Going right before closed allowed for us to tour without the crowds as well. Think the pictures will be really pretty, hopefully Charlton will post them soon. We then headed back to town and poked in and out of the shops. Then we grabbed some dinner from CoCo curry (yum!) before heading back to the pagoda that had now been illuminated as it was dark, was really pretty. So we packed up our bags this morning, and hurried out of our hostel as we had to drop our bags off at the station before taking the subway to the Imperial Palace for our tour at 10. Charlton only had the name of the gate we were starting the tour and of course none of our maps had the gate names. So we had to wing it and get to the closest station and then rely on a map once we got there. I am really glad in the rush this morning I had grabbed a Nutrigrain bar otherwise I would have been famished on the hour long tour. While we did get to see a lot, didn’t feel like we see as much as we did in Tokyo, but maybe that’s just me. We did, however, have an English speaking tour guide a great improvement from the audio-guide in Tokyo. After the tour it was back to Kyoto station for lunch in the attached Isetan mall. We found a ramen shop that had a vending machine and settled in. Lunch was really good, and definitely what we needed after all that hustling this morning. was just looking at some of the blogs i read and they have beautiful travel photos of women all dressed in gorgeous summer dresses and cute outfits. how i wish i could travel like that instead of my practical workout gear that is beginning to smell a little ripe after multiple wears. oh well, you know those girls in the pictures don't have to haul their own gear and don't stay in hostels. 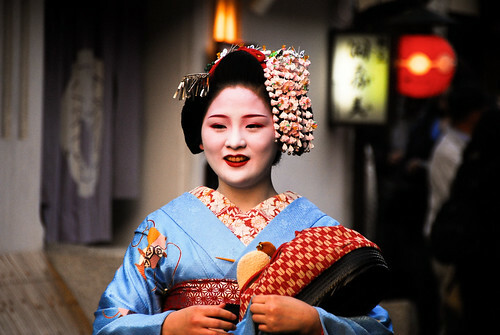 One of the Geishas we saw wandering around the Gion District last night.